Here’s what ‘Positive Psychology’ doesn’t know about true happiness. The World Happiness Report 2017, released in March, tells us that Norway is the happiest country in the world. This report is produced by the Sustainable Development Solutions Network (sdsn), a global initiative launched by the United Nations in 2012. Information for the report is taken from a survey of 3,000 respondents from 150 countries. Some of the saddest countries in the world are Rwanda, Tanzania and Burundi. This is not unexpected since the current African experience often leads to “delayed and disappointing hopes for happier lives.” The United States of America, which ranked 11 when the sdsn began its report in 2012, dropped to No. 14; the United Kingdom is listed as No. 19. This is actually a step up for the UK. The reason given for the U.S.A.’s decline is failing social support and increased corruption. The purpose of the World Happiness Report is to help countries take steps to increase the happiness, or well-being, of their citizens. Why? Stress is at epidemic levels worldwide. “Anxiety is one of the top news stories of the last decade,” wrote Todd Kashdan and Robert Biswas-Diener in their book The Upside of Your Dark Side. “According to the National Institute of Mental Health, in any given 12-month period, 1 of 5 American adults is afflicted with an anxiety disorder. The number is higher for teenagers: Twenty-five percent will suffer from a clinically significant anxiety disorder,” they continued. Kashdan and Biswas-Diener go on to say that if you consider an entire adult life span, “a whopping 1 in 3 Americans is afflicted by anxiety.” In September 2013, the Guardian reported the same numbers for British adults. Our world is constantly bombarded by catastrophic events such as Mexico’s back-to-back earthquakes; economic crises—like the 2008 banking crisis; extreme weather—consider hurricanes Harvey, Irma and Maria; the wildfires in California and the Northwest; and a string of mass shootings—the largest and the most devastating one in America to date just outside the Mandalay Hotel in Las Vegas. Is happiness even possible in our world? The answer is, Yes! But how to do you go about being happy in an increasingly dangerous and sad world? Learn Happiness on a Psychologist’s Couch? Is psychology the answer? 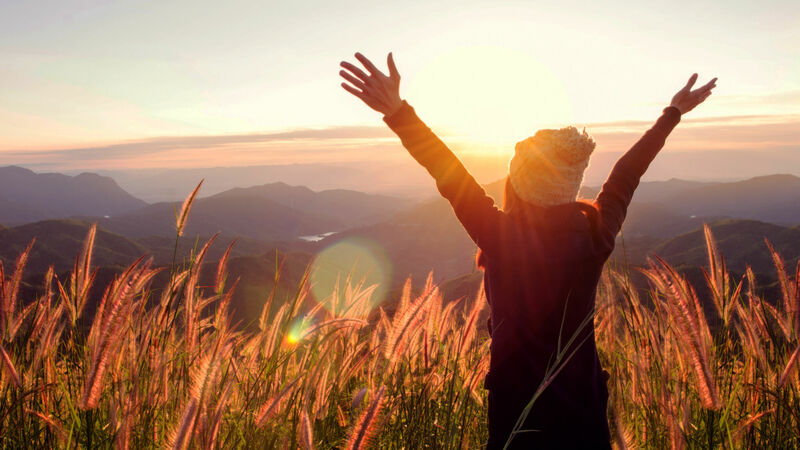 The Happiness Report is a result of the outgrowth of research in a new field of psychology called “Positive Psychology.” The movement seeks to cast aside the outdated negative psychology that focused on people’s depression and mental pathologies. This updated, upbeat psychology sets out to study the most positive qualities of an individual, most specifically the qualities that lead to happiness. Positive psychology researchers have put in decades of effort, completed informative research, and made some positive contributions to people’s lives. However, positive psychology science has collected its critics too. More traditional psychologists point to mental disorders that cause intense suffering and impair happiness; for example, schizophrenia can never be cured by the techniques of positive psychology. Even some psychologists new to the field of positive psychology, such as Todd Kashdan and Robert Biswas-Diener, don’t agree with the early tenets of positive psychology. “[B]oth of us were also increasingly put off by the gung-ho happiology we often witnessed,” they wrote. Several tenets of positive psychology are worth knowing. Yet one vital, proven key to attaining happiness exists that positive psychology theorists completely overlook. Knowing and applying this key will open the door to sustained happiness—even in this sad, tragic world. In The Happiness Hypothesis: Finding Modern Truth in Ancient Wisdom, Jonathan Haidt, a social psychologist and active participant in the early positive psychology movement, discusses 10 ideas of wisdom using short quotes from writers—including Benjamin Franklin, Buddha, Confucius, Epictetus, the Apostle Paul, King Solomon and William Shakespeare—to validate the major findings of positive psychology. However, the book is mainly a detailed explanation of the principles advocated by positive psychology theorists. Positive psychologists struggle to understand why there is a “good” side to human thinking that can lead a person to be happy and perform great acts of kindness. His chapter “The Divided Self” focuses on recent human brain and body research. Positive psychologists struggle to understand why there is a “good” side to human thinking, which can lead a person to be happy and perform great acts of kindness, and a “darker,” impish or devilish side, which can lead another person to be depressed and even potentially commit horrible acts of evil. Haidt’s discussions on recent brain research are interesting. Of course, his conclusions are hypotheses. He recognizes that the physical human brain is a magnificently designed organ in the human body, but he attributes its design to evolution. We can agree on one conclusion that Haidt discusses: There are two processing systems “at work in the mind at all times.” One is controlled, or conscious, thinking. The other is automatic, or unconscious, thinking. Humans utilize both functions daily. During controlled thinking, our conscious mind can only think of one thing at a time. For example, a student cannot read a textbook and carry on an intelligent conversation at the same time. The automatic process is different. Our “automatic” brain directs our stomach to digest food, our kidneys to process waste, our heart to beat, and our lungs to breathe—without our notice. Yet some automatic brain processes have been learned with the aid of the conscious mind. For example, humans must learn to walk, talk, drive a car and type. Once we consciously learn these functions, the brain moves them to the automatic system. It’s amazing! Automatic brain processes make us more efficient. There is a catch though. Our emotional reactions, fears and prejudices are also stored in the brain’s automatic system. This causes us to have biased thinking without realizing it. We usually don’t stop to think about why we are thinking the way we do. We seldom consider why we react to situations the way we do. We don’t need to. Why? Our patterns of thinking have been learned and flipped into the brain’s automatic operations. This is important to know because our biases determine our view of the world, our perceptions of other people, and the events that take place in our lives. Genetic studies of identical twins separated at birth, raised in separate family environments, and reunited as mature adults show that the twins are often perfectly matched in their outlook on life. One set of twins studied is known as the giggle twins. The sisters both had a “sunny disposition and a habit of bursting into laughter in mid-sentence” even though they were raised by different parents in different environments. Haidt views this set of twins as born with a “genetic set point” to see good in the world. Studies of other sets of identical twins, also separated at birth, found that they see the world as a gloomy place. If optimism is the foundation of your way of thinking, then it will be easier for you to maintain a happy state of mind, even when facing negative situations. If you are naturally pessimistic, then you are likely to be depressed about your life and allow personal difficulties and negative world events to overwhelm you. Haidt believes that William Shakespeare knew this fact when he created the character, Hamlet. Hamlet tells his friends Rosencrantz and Guildenstern in Act II, Scene 2: “There is nothing either good or bad, but thinking makes it so.” Shakespeare did have a good understanding of human nature. It is our biased human thinking that makes things appear good or bad. Shakespeare crafted the character Hamlet to represent pessimistic thinkers. Haidt makes many sensible points in his book. For example, people who have close relationships with family and friends tend to be happier people. They also weather personal storms better because of the emotional support from family and friends. People who are giving to others tend to be happier. One technique that positive psychologists recommend to their patients is to regularly perform random acts of kindness toward others. Grateful people also tend to be happier people. People who have reasonable expectations about life deal better with life’s ups and downs. However, people who have unrealistic notions about the way life and the world should work are often disappointed. For example, Haidt states strongly that money doesn’t buy happiness. He even shows positive psychology research that backs up this point. The vast majority of human beings, however, believe that money and material things bring happiness. “If money or power could buy happiness, then the author of the Old Testament book of Ecclesiastes should have been overjoyed,” wrote Haidt. He is referring to King Solomon and his search for happiness in riches, physical pleasure and power. “I made great works; I built houses and planted vineyards for myself,” wrote Solomon (Ecclesiastes 2:4; English Standard Version). This was just the start. Solomon was rich and could afford anything he wanted, including 700 wives and 300 concubines (1 Kings 11:3). For all of Solomon’s efforts to find happiness, though, he didn’t find it. “So, I hated life, because what is done under the sun was grievous to me; for all is vanity and a striving after wind,” he concluded (Ecclesiastes 2:17; Revised Standard Version). Haidt explains that Solomon realized “nothing brought satisfaction.” Getting the big promotion, the huge raise, or even winning a lottery only brings momentary happiness. The true reality of this human life is that striving for material possessions is “striving after wind.” Physical success and material wealth bring only temporary happiness. Happiness Without God and Religion? Solomon ended up a candidate for suicide. Yet in his older years, this king learned the deepest lesson that “happiness can only be found within,” wrote Haidt. Like other psychologists before him, Jonathan Haidt recognizes that there is a spiritual dimension to man. Please understand! Here is where Positive Psychology falls off the cliff of truth and good reason. “My claim is the human mind perceives a third dimension, a specifically moral dimension that I will call ‘divinity,’” he wrote. For Haidt, divinity is a process of mind. People experience divinity as a physical, or emotional, feeling of elevation, “a lift up,” or as a perception of becoming one with the universe. He believes that Dr. Timothy Leary experienced intense “divinity,” or transcendence, while experimenting with lsd. “In choosing the label ‘divinity,’ I am not assuming that God exists and is there to be perceived. (I am a Jewish atheist. ),” he wrote in a chapter titled “Divinity With or Without God.” “Rather my research on the moral emotions has led me to conclude that the human mind simply does perceive divinity and sacredness, whether or not God exists.” Haidt believes that people can be spiritual without a belief in God or following the dictates of a certain religion. Why? There is already a “god” in every man. “The overwhelming evidence is that we are animals,” states Haidt. So he reasons that the “divinity” in man is the result of an advanced evolutionary process. He believes that the human mind can give humans a noble nature when “divinity” is experienced. “Religious experiences are real and common, whether or not God exists, and these experiences often make people feel whole or at peace,” he writes. “Should people be allowed to use birth control, abortion, reproductive technologies and assisted suicide as they please? It depends on whether your goal is to empower people to manage some of the most important choices of their lives, or whether you think all such decisions must be made by God,” states Haidt. Of course, Haidt embraces an “ethic of autonomy,” which guarantees that people are free to make their own choices. Yet man’s tragic history is replete with the results of making choices without law. This is what the Holy Bible is all about. Haidt is skilled at making Positive Psychology sound good, but there is a big problem he cannot answer—and he even admits it! While he believes that evolution gave the human mind the ability to experience divinity and do noble things, that means evolution also gave the human mind the proclivity to be evil and inflict evil on others. He calls this problem the satanic self. This does not mean that Haidt believes in Satan; he believes that evolution has given man a raw deal. It is interesting that he can see a true paradox with the human mind. However, he does not offer a satisfying solution on how to deal with the problem. But solving this paradox is the key to finding happiness. Here’s good news. The paradox has been solved. The most important theologian of the 20th century, Herbert W. Armstrong, was used by the one true God to unlock seven incredible mysteries hidden within the pages of the Holy Bible. Mr. Armstrong thoroughly explained these mysteries in his most important book Mystery of the Ages. “The universities … take the human brain apart and study it, yet the human mind remains a total mystery to even the most advanced psychologists,” wrote Mr. Armstrong. “They do not know what man is or why he came to be!” What is man? Why is man? These are the two most important question to ask, and they have been answered. “Is he merely the highest animal species, descended by resident forces, with no intelligent planning or designing, by the process of evolution?” Mr. Armstrong asked. “Why does man have the thinking and reasoning ability and possess all the human fund of knowledge that is impossible for animals to have? Is he an immortal soul? Is he human flesh and blood with an immortal soul within him? Just what IS a human person, after all?” He found the answers. To find true happiness, you need to know and believe that God exists, that Satan exists and that man, although he is currently made of flesh, is not an animal. You must also understand God’s incredible purpose for creating mankind. All of these topics are thoroughly covered in Mystery of the Ages. The book is yours free upon request—with no follow-up! 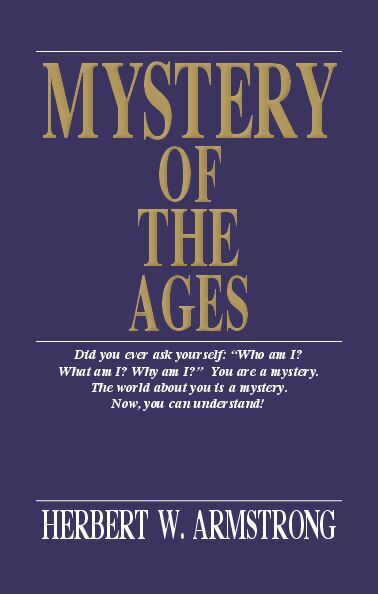 Mr. Armstrong fully explained the mystery of God in the first chapter of Mystery of the Ages. Read Genesis 1:1. “This originally was written by Moses as God inspired him,” Mr. Armstrong wrote. “Moses wrote in Hebrew. The Hebrew word translated ‘God’ is Elohim—a noun or name, plural in form, but normally singular in grammatical usage.” You can easily prove Mr. Armstrong’s statement here by using a Bible concordance. “It is the same sort of word as family, church, group—one family consisting of two or more members—one church composed of many members—one group of several persons,” he continued. Read also John 1:1-3. “It is referring to precisely the same Persons, making up or composing the one God, as we found in John 1:1—the Word and God—and each of those two Persons is God. In other words, God is now a family of persons, composed so far of only the two—God the Father and Christ the Son,” wrote Mr. Armstrong. God is also Creator, Ruler and Educator. God need not be a mystery to you. Let’s talk briefly about the reality of Satan. Mr. Armstrong devoted an entire chapter (“Mystery of Angels and Evil Spirits”) to God’s creation of angels. God did not create a devil to harass mankind. God’s creation of the archangel Lucifer was a stupendous feat of creative artistry. He was highly intelligent, brilliant in beauty and trained in leadership and God’s government (Ezekiel 28:12-14). He and one third of all the angels were given responsibility to help God finish beautifying the Earth. Lucifer was given the throne of the Earth and great authority. It was his specific job to oversee the work of the angels by administering the government of God, which included administering the law of God. Lucifer failed (Isaiah 14:12-15; Ezekiel 28:15-19). He believed he had a better way than God. He led his angels in a gigantic rebellion to kick God off the throne of the universe (Isaiah 14:13-14). This was a grave sin (2 Peter 2:4; Jude 6). In their war against God, the rebellious angels destroyed the Earth, subjecting it to ruin and darkness. Lucifer became God’s adversary and was renamed Satan; the angels that followed him became demons. For this present time, Satan is still sitting on the throne of the Earth (John 14:30; 12:31; 2 Corinthians 4:4). He and his fallen angels (also still on this Earth) hate God and mankind. Although man has his part, these wretched beings are the first cause behind the evil, troubles and sadness in our modern world. The tragic failure of Lucifer and his angels led God to make an incredible decision. “God saw that no being less than God, in the God Family, could be certainly relied on never to sin—to be like God—who cannot sin,” wrote Mr. Armstrong. “To fulfill His purpose for the entire vast universe, God saw that nothing less than Himself (as the God Family) could be absolutely relied upon to carry out that supreme purpose in the entire universe.” So, as Moses wrote, God said, “Let us make man in our image, after our likeness” (Genesis 1:26). Animals were made after the animal kind (verse 25). Man was created after the God kind. Through mankind, God intends to greatly expand His Family to finish the creation of the limitless universe. What astounding knowledge! Satan has worked for millennia to blind mankind to this truth. How is it possible for man to become God? Please read Genesis 2:7. “Man, formed from material dust of the ground, upon breathing air, became a living soul. It does not say man is, or has, an immortal soul. What was formed from material ground became a soul,” wrote Mr. Armstrong. This truth will come as a shock to many people. “Therefore the soul is physical, composed of matter, and can die. This is a truth believed by very few denominations, and probably by no other religions—another proof that identifies the one true Church of God!” continued Mr. Armstrong. Yet there is a spiritual dimension to man. “Many passages of Scripture show that there is a spirit in man. Spirit is not matter, and man is matter. To distinguish it from God’s Holy Spirit, I designate it as the ‘human’ spirit. Nevertheless, it is spirit and not matter,” wrote Mr. Armstrong. “This ‘human’ spirit imparts the power of intellect to the human physical brain. The spirit cannot see, hear, taste, smell or feel. The brain sees through the eye, hears through the ear, etc. The ‘human’ spirit cannot of itself think. The physical brain thinks.” This is the only true and rational explanation of how the human mind functions. To find true happiness, you need to know and believe that God exists! “What, then, is the function of this ‘human’ spirit?” asked Mr. Armstrong. “It is not a ‘soul.’ But 1) it imparts the power of intellect—of thinking, and of mind power, to the human brain; and 2) it is the very means God has instilled, making possible a personal relationship between human man and divine God.” Positive psychologists know that people who develop close relationships with family and friends are happier people. But they overlook the most important relationship necessary for a man, woman or child to find true happiness—a relationship with the Creator God. God deeply desires a relationship with all mankind. Why? So man can develop the character of God and become a spirit-born son of God (John 3:3-13). However, Satan has the power to reach your human spirit by broadcasting his cunning deception (Ephesians 2:2). He doesn’t broadcast in words. He surcharges the air with depressed moods, bad attitudes, negative emotions of hatred, envy and anger toward others and hostility toward God and His laws. Satan is the author of Haidt’s “impish” self. Yet you can learn to detect Satan’s broadcast and resist it—with God’s help. “The fear of the Lord is the beginning of knowledge: but fools despise wisdom and instruction,” Solomon wrote (Proverbs 1:7). Do you fear God? If you truly want to have happiness in your life, this is the first step you must take. God knows the perfect way to human happiness. He will gladly teach it to you. “Happy is the many that findeth wisdom, and the man that getteth understanding,” Solomon continued. Of course, this wisdom comes only by a relationship with God. If you are struggling with sadness—even sadness caused by trials and adversity. There is a way you can regain happiness. Besides requesting Mystery of the Ages, also request a copy of our reprint article “The Mystery of the Two Trees.” These two publications provide vital information for living the way of life that brings true happiness.